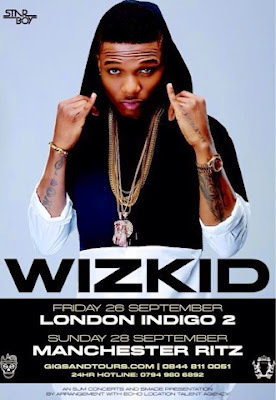 It's Just Mobolaji | Music & Entertainment: Wizkid Announces Headlining UK Tour for September 2014! Wizkid Announces Headlining UK Tour for September 2014! Shortly after the announcement of Essex Fest being cancelled, Wizkid has announced his own UK headlining tour scheduled for September 2014. It's been two years since Wizkid hit the stage for his own headlined show in the UK at the HMV Hammersmith Apollo. April 2014 saw him as a special guest at label mate Tinie Tempah's UK leg of his ‘Demonstration’ tour alongside duo Krept & Konan. The announcement only comes with two dates so far for London and Manchester, and no opening acts or special guests have been announced either. Wizkid's UK fans have been brewing with excitement following this announcement; hopefully his sophomore album comes before the tour kicks off. The announcement comes extra special as today's Wizkid's 24th birthday - Happy Birthday to him! Full details about his forthcoming UK tour as seen below! Tickets for London are priced from £26 and tickets for Manchester are priced from £19.50 - full ticketing info can be found at gigsandtours, and will be on sale at 9am on Friday, 18th July.